HUNTERSVILLE, North Carolina (April 9, 2019) – Kyle Busch, driver of the No. 18 M&M’S Toyota for Joe Gibbs Racing (JGR), knows plenty about winning. He’s the winner of 54 career Monster Energy NASCAR Cup Series races, which includes his eighth career win at last weekend’s venue, Bristol (Tenn.) Motor Speedway. 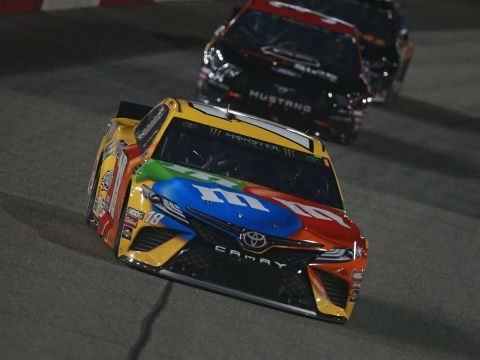 Richmond (Va.) Raceway, site of Saturday night’s Toyota Owners 400, is yet another place where Busch has shown a propensity to find victory lane. Busch swept both 2018 races and is a winner of six Cup Series races at the .75-mile short track while also owning a head-turning average finish of 6.9 in 27 career starts. While Busch will bring back the familiar yellow M&M’S scheme to the track at Richmond this weekend, he’ll be bringing attention to three, brand-new, limited-edition flavors as part of M&M’S third Flavor Vote campaign: Mexican Jalapeño Peanut, Thai Coconut Peanut and English Toffee Peanut. The new flavors are on sale at select retailers nationwide, where fans can purchase and try each new flavor and cast a vote for their favorite once a day until May 17. By voting in this year’s M&M’S Flavor Vote, fans will be entered for the chance to win a trip to all three countries that inspired the new flavors: Mexico, Thailand and England. Fans can try each new flavor and cast a vote online at http://www.flavorvote.mms.com, or text the word “Vote” to 84444 and follow the instructions in the reply text messages. After voting closes May 17, the flavor with the most votes will be announced in August. Back to the task at hand this weekend, a quick look at the Richmond stat sheet for Busch can easily make the case he is most consistent at the .75-mile short track in Virginia’s capital city. Along with four series wins there, Busch has amassed 15 top-five finishes and 18 top-10s in 27 career starts there. Additionally, the Las Vegas native is tops among active drivers with his aforementioned average Richmond finishing position of 6.9. Next best is Kevin Harvick’s average finish of 8.1. Busch has completed all but one of the 10,829 laps available to him in his 27 Richmond starts. Of those laps completed, Busch has run in the top-15 for 9,602 laps, or 88.7 percent, which ranks second among active drivers. Saturday night, Busch and the M&M’S team look to get back to victory lane at Richmond where, in addition to last year’s sweep of the spring and fall races, Busch also won four consecutive Cup Series spring-race wins from 2009 to 2012, besting Richard Petty’s previous record of three Richmond spring-race wins in a row from 1971 to 1973. With those impressive statistics and records to back him up, it’s little wonder that a visit to the “Capital of the Commonwealth of Virginia” is one of Busch’s favorite stops on the NASCAR tour. Busch will look to post back-to-back victories for the second time this season as the 2015 Cup Series champion won back-to-back races earlier this season at ISM Raceway near Phoenix and Auto Club Speedway in Fontana, California. Busch has set the high-water mark for the series thus far with a series-high three victories while also scoring top-10 finishes in each of the eight races contested thus far. So, as the series heads to Richmond for the first time this season, Busch and the M&M’S team look to bring home their seventh win there together. While M&M’S fans will be choosing a winner between Mexican Jalapeño Peanut, Thai Coconut Peanut and English Toffee Peanut off the track, Busch will look to continue his winnings ways on it. What are your thoughts going into Richmond this weekend? What does it take to get around Richmond? What is it about Richmond that suits your driving style? Can you compare Bristol and Richmond? Do you enjoy the atmosphere at Richmond? The Toyota Owners 400 will mark Kyle Busch’s 507th career Monster Energy NASCAR Cup Series start and his 28th NASCAR Cup Series start at Richmond (Va.) Raceway. Busch has career totals of 54 wins, 31 poles, 189 top-five finishes, 277 top-10s and 16,277 laps led in 506 career Cup Series races. His most recent Cup Series win came three races ago at Auto Club Speedway in Fontana, California, his second consecutive Cup Series victory. Busch’s most recent pole, the 30th of his career, came in October at Martinsville (Va.) Speedway. Busch has six wins, 17 top-five finishes and 20 top-10s and has led a total of 1,183 laps in 27 career Cup Series starts at Richmond. Busch’s average Richmond finish is 6.9. 54 Career Cup Series Wins: With his Cup Series win at Bristol (Tenn.) Motor Speedway last weekend, the 54th points-paying win of his career, Busch sits tied for 10th all-time in Cup Series wins with NASCAR Hall of Famer Lee Petty. 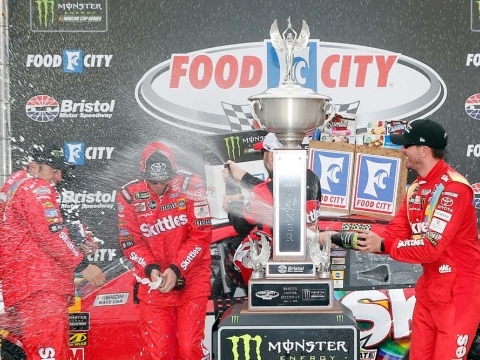 With his 40th Cup Series victory at Bristol in August 2017, Busch became the fourth-youngest driver to reach 40 Cup Series wins at 32 years, 109 days, behind only Richard Petty, Jeff Gordon and Herb Thomas. Eight-for-Eight: Busch has notched eight top-10 finishes in the eight races contested so far this season in NASCAR’s top series. Six of those were top-fives along with three victories, the lone “blemishes” being his sixth-place finish the second week of the season at Atlanta Motor Speedway and his 10th-place result at Texas Motor Speedway in Fort Worth two weekends ago. Morgan Shepherd finished in the top-10 for the first 11 races of the 1990 season, which is the record for NASCAR’s modern era.